Recently, I did a story on PopFi about a brand of wine that comes in aluminum bottles. Dubbed Flasq Wines, at the time I thought it was a pretty cool idea, but I was dubious about the quality of the wine, if only because I’m skeptical of anything. However, my skepticism was unfounded. I had a nice talk with @FLASQwine on Twitter, then had an email exchange, and the next thing I know I’ve got two shiny aluminum cans of Flasq on my desk. Long story short, it’s tasty stuff. I’m not a big wine drinker, but for a good reason. I like single-serving things, and wine doesn’t come that way. On the rare occasion I pick up a bottle of wine, I either have to make sure the whole bottle gets finished after opening or the wine eventually goes bad and has to be thrown out. 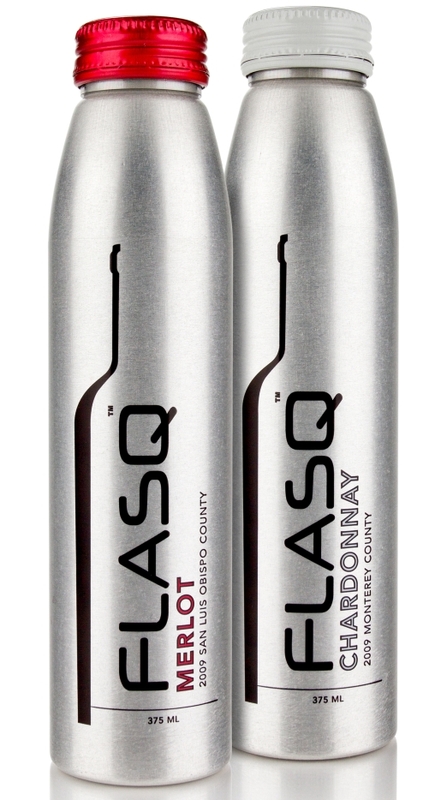 Flasq solves that problem with 350 ml aluminum bottles that contain special coatings inside the can to preserve the wine taste from the aluminum, while the aluminum bottle protects the wine from light during shipping and shelving, cools down five times faster than glass, and is more eco-friendly than glass. From a packaging standpoint, Flasq is the best of both worlds, but how does it taste? I was sent two bottles, a 2009 Monterey County chardonnay (white wine) and a 2009 San Luis Obispo Merlot, both bottled by JT wines at The Ranch Winery in St. Helena, California. Of the two, my favorite is probably the red (but red is my favorite wine in general). It’s a very rich, smooth wine, with strong notes of ripe blackberries and a little bit of spice. The white took a bit of warming up to, but once I acclimated to the citrus and apple fruit taste, it was definitely a pleasant experience. I would definitely recommend Flasq Wines to my wine-drinking friends, and the company has recently expanded its distribution to my home state of Kentucky (check availability in your state here). It’s a delicious beverage, the perfect size for enjoying on the beach or on a picnic, and hopefully it will be in your area soon. At a retail price of $5.99-$7.99 a bottle, it won’t cost you anything to give it a shot.